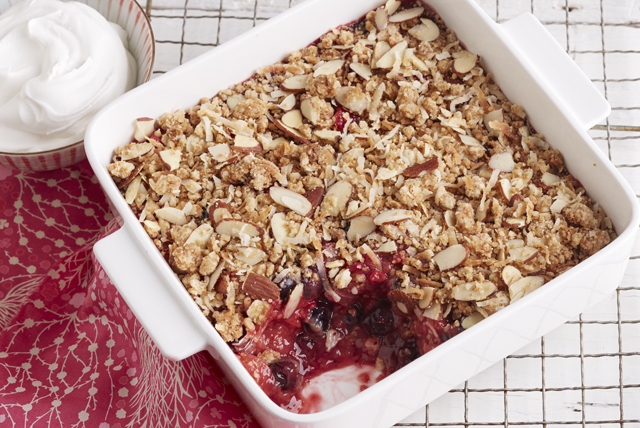 Our Mixed Berry Crisp recipe is a must-try. This fresh berry dessert with oven-baked taste keeps your kitchen cool by using the microwave! Mix flour and 1/4 cup sugar in medium bowl. Cut in butter with pastry blender or 2 knives until mixture resembles coarse crumbs. Stir in coconut and nuts; spoon into 9-inch square microwaveable dish. Microwave on HIGH 3 min., stirring after each minute. Microwave 1 to 2 min. or until streusel is crisp and golden brown, stirring every 30 sec. Spread into single layer on large plate; cool. Meanwhile, combine fruit in same microwaveable dish. Add dry pudding mix and remaining sugar; mix lightly. Microwave 4 to 5 min. or until fruit is hot and bubbly; stir. Cool 15 min. Sprinkle streusel over fruit mixture. Serve topped with Cool Whip. If your brown sugar has turned into a hard, compacted lump, add a slice of bread or an apple wedge to the bag or canister. Seal and let stand until softened, about 1 to 2 days. For quicker softening, microwave on HIGH at 30 second intervals, just until softened, taking care not to melt the sugar. When a recipe calls for cutting butter into a dry mixture, make sure the butter is cold. Slice the butter into tablespoon-size portions, then add to the dry mixture. Use a pastry blender or 2 knives to cut the cold butter into the dry ingredients. When the mixture resembles coarse crumbs, it has reached the proper consistency.